In this topic we will look at the role of the Operating System (OS) and how we can access the OS from Python. So What is the Operating System? Most computer users know that their computer has an operating system, whether it be Windows, Linux or MacOS or some other variety. But not so many know exactly what the operating system does. This is compounded by the fact that most commercial operating systems come bundled with lots of extra programs that are not really part of the operating system per se, but without which the computer would not be very usable. Examples of these extras are image viewers, web browsers, text editors and so forth. So what exactly is the operating system and why do we need one? The answer lies in the way computers are built. We can think of them as a layer cake with the computer hardware, the electronics, at the bottom. The hardware includes the Central Processing Unit (CPU), the hard disk, the memory, the Input/Output subsystem (usually abbreviated to IO - pronounced Eye-Oh) including things like USB ports, Card slots, Network connections and so on. The next layer up from the BIOS is where we hit the operating system proper. The structure of this layer depends a lot on the individual operating system but generally it comprises a kernel or core set of services with associated device drivers. The device drivers may be built into the kernel or they may be modules loaded by the kernel as needed - very similar to the way Python's modules get loaded by programs as they are needed. What this layer does is translates from the low-level hardware to the logical structures that we recognize and use, like files and folders. One important point of note is that the same computer hardware and BIOS can run many different operating systems. Indeed, you can usually create a multi-boot configuration where you select which of several installed operating systems you want to start up in when the computer first starts up. The penultimate layer in the cake is the shell which is the user environment. On modern operating systems this is usually presented as a Graphical User Interface although a command line of some kind is nearly always available too. Finally, we have the user software layer. This comprises the suite of programs that are installed by the user (or perhaps pre-installed by the OS vendor). It include favourites like web browsers, email programs, word processors etc. It also includes programming tools like Python. The operating system looks up some internal data and translates the filename into a set of tracks and sectors on the hard disk (and indeed figures out which hard disk!). It marks that file as open and, if necessary, locks it from other users changes. The operating system then calls several BIOS functions to position the heads at the right location. The operating system instructs the BIOS to read the right number of bytes from that location. The operating system repeats the BIOS locate/read sequence steps as often as is necessary to read all of the data required for our file. If that all sounds pretty complicated that's because it is! The good news is that the reason we have an operating system is to save us mere mortal programmers from having to think about it, we just call open() and read(). However the operating system does more than simply control access to the hardware, it also provides the ability to launch a program. In fact it provides the mechanisms for managing all of the programs that run concurrently on your computer. The reason it needs to do this is that usually there are far fewer CPUs than there are programs so, to produce the illusion of all these programs running at the same time, what happens is that the operating system switches between them very quickly, giving each program a share of the CPU - a technique known as time-slicing. Some operating systems are better at this than others, for example early Windows and MacOS operating systems could only multi-task in this way with cooperation from the programs being run. If an errant program failed to provide a suitable pause point the computer would appear to lock up! Most modern operating systems use a system called pre-emptive multi-tasking whereby the operating system interrupts programs regardless of what they are doing and automatically gives the next program access to the CPU. Various algorithms are used to improve the efficiency of this process, depending on the operating system. Common examples are: round robin, most recently used, least recently used, and there are several others. Again, from a programmer's point of view, we can usually just ignore all of this and pretend there really are multiple parallel programs running. Modern computers nearly all come with multiple processors. These may be multiple physical silicon chips or multiple cores (which are like individual processors all built into a single chip). It is the operating system's job to allocate running processes to CPUs and cores to ensure optimal usage. Once again, as programmers, we don't need to think about this, we just let the operating system do its thing. The final aspect of the operating system that I'm going to mention is the control of Users. Most modern computers can at least allow several different users to access the machine, each with their own files, desktop settings etc. Several operating systems go one step further and allow several users to be logged in at the same time, this is sometimes called multi-session operation. However, with many users comes the issue of security, it's important that John can't see Janet's data and vice versa (unless the user wants them to, of course). The operating system is responsible for ensuring that each user's files are securely protected and only those with the appropriate authority can access data. Since the operating system's job is to abstract away all these details you may be wondering why we as programmers should be interested in it at all, apart from academic curiosity, perhaps? The answer is that sometimes we need to interact with the hardware in ways that the standard programming functions don't allow, or maybe we need to launch another program from within our own. At other times we may want to control the computer, in the same way a user would, from within our programs. To do any of these things we need to get access to the underlying operating system facilities. Python provides a number of modules for interacting with the operating system. The most important is called the os module and it tries to provide a common interface to any operating system by loading other lower level modules under the covers. The end result is that you can call the functions defined in the os module but some operating systems will behave slightly differently depending on the way they implement those functions internally. This doesn't normally present a problem, but if you do encounter strange behaviour from the os functions check the documentation to see if there are any restrictions on your operating system implementation. The other operating system modules that we will consider are shutil, which provides user level control of files and folders to programmers. 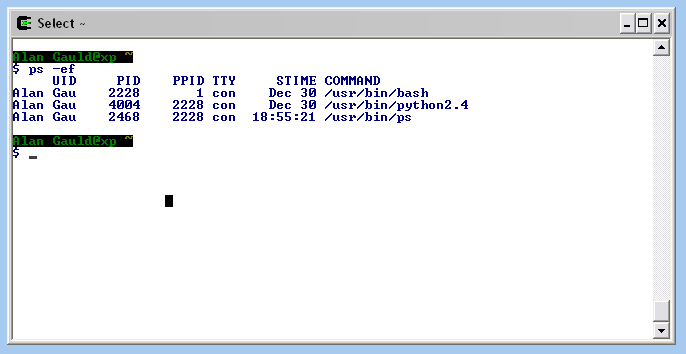 Also os.path and glob both of which provide facilities for navigating the computer file system. In fact that's the part we will look at first. Caveat: As already mentioned, operating systems are inherently different and so the examples below will mostly not work on Windows (you will need to work out what the equivalent Windows CMD commands are (where they exist) and substitute them for the Unix commands in the text). I apologize but duplicating every example twice would just be too messy. Those using Linux or MacOS X should find things work just fine provided you have the relevant programs installed (eg. not every Unix OS comes with ex installed by default). We've already covered handling files earlier in the tutorial, so what can the operating system help us do that we can't already? Well for one thing we can delete files, the standard file methods allow us to create them and to modify them but not delete them. Also we can search for files. open() is great if you know where the file lives but if you don't, how can you find it? Extending that idea what about handling groups of files - let's say you want to manipulate all of the image files in a folder. And finally what about finer grained control of what we read from a file? The standard methods read either a single line or the whole file, but what if we only want a few bytes? All of these things are possible using the OS functions. And you get a list of the text files in the current directory. Which begs the question how do we know what the current directory is? And can we change it? Of course we can - by using the os module! So now we know how to look for a file in the current directory and how to change the current directory to the one we want. But that still makes searching for a specific file a tedious exercise. To help in that we can use the very powerful os.walk() function. We will look at an example of os.walk being used to find a specific file located somewhere under a starting point. We'll create a findfile function that we can use in our programs. This clearly shows the path taken by os.walk. It also shows how we can find a file and construct its full path by looking in the files element of the tuples returned by os.walk and combining the name once we've found it with the root value of the containing tuple. Notice that the first argument to find_file()) is 't.*'. Remember that it is a regular expression not a filename wildcard such as you would use with glob. So it stands for a t followed by zero or more other characters, not just a file like t.txt. The output shows that it works, and notice in the last example that it only works for files because the directory names are in the dirs lists which we didn't check. As an exercise try adding a new function to the findfile module called find_dir() that searches for directories matching a given regular expression. Then combine both to create a third function find_all() that searches both files and directories. Recursively move a file or directory to another location. If the destination is on our current filesystem, then simply rename src. Otherwise, copy src to the dst and then remove src. If path is a directory, OSError is raised; (see rmdir() to remove a directory). If dst is a directory, OSError will be raised. In the examples we moved and copied the files, deleted the remaining original file then used rename to restore the folder back to its original state. These are all operations a user might do at a command prompt or in a file browser but here we have done them using Python. Note also the use of a for loop to do multiple changes. Obviously we could have added all manner of checks and rules within the loop, giving the potential to create some very powerful file manipulation tools. And of course, by typing the code into a script, we could perform these changes as often as we wished by simply running the script. Often when dealing with files we need to know something about the characteristics of the files in question. For example when reading a directory listing, from glob say, is the "file" in question really a file, or is it a directory? Also it might be useful to find out when it was last modified, or even to monitor it to see if it is being regularly modified - thus indicating that another user or program is accessing the file. We might similarly want to monitor the size of a file to see if it's growing. Note that the test functions are found in the os.path module. Also note that there are several other tests available which you can read about in the os.path module documentation. The next characteristic of a file that we will look at is its age. There are a number of interesting dates in a file's lifeline, the first of which is its creation date, the next its most recent modification date and finally the date of the last access. Not all operating systems store all of the dates but most will provide creation and modification dates. In Python the creation and modification dates can be reached through the os.path module using the ctime() and mtime() functions respectively. We'll take a look at some of the files in our Root structure. They were all created at nearly the same times but the top level files will be slightly different because we manipulated them in our earlier example using rename(). Notice the slightly bizarre result for FA? It appears it was created after being modified! That's because we created it as a copy of the original file, then we deleted the original and renamed the copy back to the original name. The OS recognizes that the rename didn't change any content so didn't alter the modification date(which is the time of the copy operation) but sees the rename operation as the creation time for the current filename (since we deleted the original, this must be a new FA.txt)! For FB.txt its a slightly different story. This time we moved the file rather than copying so the content never changed. Thus the modification date remains the original creation date (compare the other files)). But again the rename operation is seen as producing a new FB.txt file so it shows the later time. There is a useful OS function that can return most of the information we ever need about a file in a single tuple. It's called stat() and there are several variants available, however we will only look at the version found in the os module. Note that there may occasionally be some extra fields depending on what the underlying operating system supports. Check the documentation for your platform. >>> fmtString = "protection: %s\nsize: %s\naccessed: %s\ncreated: %s"
Notice that apart from size, which is simply the number of bytes in the file, all the other values need a bit of decoding to make them human readable. We'll look at how to work with each of them. The timestamps are easy since the numbers are just the number of seconds from the epoch - we covered that earlier in the tutorial - and we can use the time module functions (as we did with localtime() above) to convert to a meaningful data structure or string. The protection format needs to be decoded and the decoding is done using some special values found in the stat module. However, we also need to use some operators, known as bitwise operators, which we haven't discussed yet. If you haven't come across these before read through the material in the box below before continuing. The stat module contains a set of predefined constants - ie. variables with a value which is not intended to be changed. These constants allow us to decode the permissions data using bitwise operators. The bitwise operators are the same as the boolean logical operators we have used before: and, or, not and one new one xor. The difference is that, as the name suggests, these versions operate on the individual binary bits of data rather than the overall value. Notice that the '0b' at the start of the string is optional since the second argument of 2 tells Python it must treat the string as binary. This can be useful if you are reading the string from a user, for example, rather than using the output of bin. Now we will look at how the bitwise operators work using the bin function to display input and output values. Let's look at those results and think about what is happening. Recall that a logical and is true if, and only if, both values are true. Similarly a bitwise & is true (value 1) if two corresponding bits are true (value 1). So for 5 & 1 the right-most bit is one in both cases, so the result also has its rightmost bit set to one. For 5 & 2 there are no locations where both bits are ones, therefore the result is all zero. This behaviour leads to an exciting feature of bitwise & operations. By 'and'ing a binary value with a number containing a single binary digit set to one we can find out if the corresponding bit in the test value is also at one, if it is, we will get a non-zero result back (which corresponds to True in boolean terms). You should find that 2,3,6 and 7 all have their second bit set. We can do similar things with the bitwise 'or', which is the | symbol, the bitwise not which is ~ (be careful though, this one results in some slightly strange results that reflect how computers store negative numbers internally). Play with these using the bin() function to display the bits input and the output. Hopefully you will see how the various operators work. Just remember to compare the values bit by bit. The final bitwise operator is the exclusive or or xor operator which has the symbol ^. The exclusive or is true if either one of the test values is true but not if both are true. This has some interesting results. For example any number xor'd with itself always results in zero! Similarly any number xor'd with a key will produce a result which, if it is then xor'd with the same key, will return the original result! This is very useful in cryptography. Let's look at a few examples before we return to the stat module and the business of finding permission values. Notice that in the last case the result is the binary string for 5. In other words, by applying 'xor' 2 twice, we got back to the original value. The stat module is essentially a set of predefined masks for examining the permissions flags returned by the os.stat() function. Now we will look at some of the stat values as binary numbers and see if we can work out how to use them. Those are usually the only permissions we care about, but if you need more, read the stat module documentation carefully then check your understanding by experimenting at the Python >>> prompt. There is also a helper function, access(), in the os module that allows you to check the most common access permissions more easily. However, the bitmask approach described above covers more options, so can be used where access() would not be sufficient. These permission sets are often represented in documentation by a 9 character string comprising three groups of 'rwx' characters with a dash replacing a character if that permission is not set. Thus the string "rwxr-xr--" means that the user has read, write and execute(rwx) permission, the group has read and execute(r-x) and the world has read only(r--) permissions. Both of the examples above do the same thing, they set the owners permissions to read, write and execute while setting the group to read and execute and the world rights to read only. If you take the time to become familiar with the octal/binary conversions then the octal version is certainly easier to type! When developing a program it's common to have the data files in the same folder as the program files so that everything can find everything else. In a program that you will use more generally you cannot assume that the files will be in a known location, so you may need to search for them - perhaps using glob or os.walk as described above. Having found the file you need you will likely need to set the full path if you want to open the file or examine its attributes. Alternatively, given a full pathname you might want to de-construct it to extract only the file name, or maybe the folder name, to hold in a variable say. os.path provides the tools you need to do that. This says that the file named 'FA.txt' is located in the Root folder, which is in the PYTHON folder, under the PROJECTS folder, in the top level directory of the F: drive. The file has an extension of '.txt'. Some of the os family of modules use a slightly different mechanism of file access to the one we are used to. This is known as a file descriptor and is more closely tied into the operating systems concept of a file than the file objects we have used up until now. The advantage of using a file descriptor over a file object is that we can access a suite of low-level file operations that enable us to gain greater control of the files and their data. 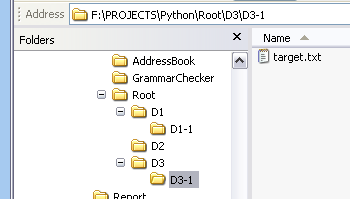 It is possible to create a file descriptor from a file object and vice versa. However, in general it's best not to try to mix the modes of operation within a single function or program. Either use file descriptors exclusively or file objects. The file descriptor functions include all of the usual file operations that we are accustomed to such as open, read, write and close. The low-level routines are usually harder to use with more potential for getting things wrong. Therefore only use low-level access if you absolutely have to. In most cases using the standard file objects will be a better solution. Under what circumstances might you need to use low-level file access? The standard operations use a concept known as buffered IO whereby data is held in storage areas known as buffers during read and write operations. Sometimes those buffers cause problems when accessing unusual hardware devices or performing time critical operations. In those cases low-level operations might be the answer, but if you are not sure why you are using them, then you probably shouldn't be! Having given a huge caveat in the previous paragraph I'm now going to say that using the low-level routines is not really so difficult, it's just that there are a few gotchas that you need to avoid. fd = os.open(fname, mode, access) # NB. os version not the builtin! And similarly we can read the data back from the file. Notice that the way we set the file access type is more complex here, we have to use a bitwise or operator to combine all of the necessary flags as provided by the os module. Secondly, notice that we can provide an access level other than the default, this is one advantage over the standard file object methods. The octal number (octal because it is starting with a zero) is the same as that described above under the heading "Changing permissions of files". When reading the data we have to pass the length of data read, we can choose to do this with the standard read too, but for low-level access it's compulsory. The actual data read and written is always a bytestring. When dealing with character strings that's not a problem since we can use the usual unicode decode method to convert the bytes to characters but for other data types you will have to use the struct module as described in the File Handling topic. One of the most common things we do as users of an operating system is execute programs. Usually we do this from within a GUI or via a command line shell, but it is also possible to launch programs from within another program. Sometimes launching a program and allowing it to run to completion is all we need to do, at other times we may need to provide input data or read the output back into our own program. The technical term for this is called inter-process communication, or simply IPC and we will look at that much more closely in the next topic. So what is a "process"? 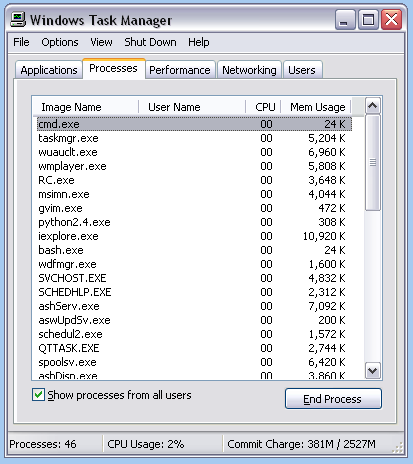 Process is a fancy computer science term for what most users call a running program. Thus we have an executable file on the computer and when we execute it, it starts running within its own memory space. It may be possible to start several instances of the same executable file, each of which takes up its own memory space and manages its own data. Each of these executing programs along with their associated operating environment is what is called a process. So now we understand the difference between a program and a process let's see how we can execute a program from Python. It turns out that for historical reasons there are a multitude of ways to achieve this. We will look at two of them, the first is very simple to use but quite limited, as you will see. The second is the recommended approach nowadays and is much more powerful and flexible. But the result in both cases should be that the terminal window is cleared and the errorcode should be zero - which indicates successful completion. This might not seem too useful but we can use system to good effect in our scripts where we only need to display the native output of the command or where we are only interested in the success or failure of the command. For example, we can require the user to edit a configuration file by starting an editor session. When the user is finished they exit the edit session and control returns to our program which can now read the modified file. The example shows a couple of useful techniques. First, it shows a way of parameterizing system calls using string formatting. It also shows us interpreting the errorcode to determine the result of the operation. If the edit succeeded (even if no changes were made!) the error code will be zero but if it failed (we couldn't find the editor say) then we will get a non-zero error value. While system is very easy to use it is not particularly flexible and has no direct way of communicating any data back to our programs. We can fake this by capturing the output to a temporary text file and then opening that file and processing it as usual. But there is a much better way of achieving the same result using another module subprocess. After various, more or less successful, attempts to improve process control a major breakthrough was achieved when the subprocess module arrived in Python version 2.4. This module was explicitly intended to replace all of the earlier mechanisms. Many examples of how to use it are given in the module documentation but we will cover the most general usage here. (There are simpler convenience functions provided if you just want to emulate the os.system functionality or similar). The module is based upon a class called Popen - notice the capital first letter! Notice the second argument shell=False. This is to prevent the command being passed through the users shell program (Bash, say) which can introduce security issues due to custom command aliases etc. You should always strive to use shell=False if possible. However, it is sometimes necessary to get the command interpreted by the shell, for example it is needed if you are passing in wild-cards such as "*.jpg" to an image processing application. The shell is what expands the wild-card into a list of actual file names. I have stored the resultant Popen instance in a variable named after the command I'm executing. This is not necessary but I find it a useful convention, especially if you are running several helper processes at the same time. At this level call is almost identical to the Popen usage described above, but call does not have all of the options available to Popen and does not create any instances so uses slightly less system resources. The downside is that it suffers from all the same disadvantages of os.system. One big improvement using subprocess rather than the older functions is that the subprocess module raises an OSError exception if the requested command can not be found. The older functions generally left you with no clear indication of an error! Here we add one extra argument telling Popen to send its standard output, stdout, to a subprocess PIPE. (We will talk much more about pipes in the next topic.) You should recall stdout and its twin stdin from the Talking to the User topic We can then access the output data using the stdout attribute of the Popen instance, which we read like any normal file. The resulting bytestring is then converted to Unicode characters with decode and printed. We could instead have assigned it to a variable and processed it in whatever way we require. There is however one small fly in the ointment. It turns out that there are some issues with accessing stdout like this. They mainly involve subtle issues around managing multiple concurrent processes and so instead we are encouraged to use the Popen.communicate method which returns a list of data streams with stdout being the first, stdin the second and stderr the third. We use Popen.communicate() to access the stdout pipe and all should now be safe and secure. Writing to a running process is far less common that reading from one, but it's good to know that it is at least feasible! There's a lot said about computer security these days and most of the facilities that ensure a secure environment are provided by the operating system. Just as other OS features are available through the OS API so we can access security features too, but with the important proviso that the operating system will still regulate our access to certain features according to the rights granted to the user who is running the program. So if we want to gain access to another users files we need to have that permission anyway, it's not an open invite to evade the built-in security of the system - at least it shouldn't be! In this section we will take a look at some of the security related functions available, such as determining the user id, changing ownership of a file and finally using environment variables to find out about the current user's environment. We use os.chdir to set the working directory to the place where the files live. We then use system() to display the directory listing (including the file permissions) before and after the call to chown() so that we can see any changes. We call chown() with the user ID that we obtain from getuid() and use -1 for the third parameter of chown() to indicate that we don't want to change the group ownership. (If we did there is also an os.getgid() function for fetching the group id). Note that the script will only have an effect if you run it as a different user from the current owner. Also that user must have permission to affect the change, so I recommend you log in as an administrator (or 'root'). Note that chown() does not tell you anything about the outcome so, if you needed to check the result, you would have to use something like os.stat to check the user id value before and after and thus check that the changes you expect have actually occurred. Programmers can take advantage of this by defining some program specific environment variables that the user can set to override the normal program default values. For this to be effective we need to be able to read the current environment to find these values. To do this we can either read a single variable using the os.getenv() function or all of the currently set variables by looking at the os.environ variable which contains a dictionary of the name/value pairs. # ... other initialization steps here. If no value exists for the variable PY_ADDRESSES then getenv() returns its second argument, which is our default location. On Linux or MacOS it is done from a command prompt by using the export or setenv commands depending on the shell being used. On some operating systems, but not all, it is possible to change the values of an existing environment variable. Be very careful if you do this since on some systems it can result in you overwriting other values. Also while some operating systems will mirror these changes back into the users environment in most cases the changes will only apply in the context of the writing process. PRINTER - determines how the user prefers to print files. That's all I'll say about environments for now. We will touch on them again in a later topic but for now, if you are wondering how to get user-specific data remember to look and see if it's already there as an environment variable, or alternatively give the user the option of setting it via an environment variable specific to your program. And there's more, much more! The os module and its friends contain far too much to cover in a single topic. In fact even the Python documentation takes several HTML pages to describe the os module alone and a page each for the other modules. Please explore the wealth of functionality provided. You will discover many weird and wonderful names in there. Many of these come from the Unix operating system and its API. The os module does its best to provide equivalent functionality on any operating system but if you want to find out more about what these functions do, often the best way is to read the Unix documentation. A good place to start, especially if you don't have a Unix/Linux system to hand, is with the O'Reilly book, Unix Systems Programming for SVR4 . And if this look at operating systems has whetted your appetite then a good general operating systems book is Fundamentals of Operating Systems by A.M. Lister. It's short and easy to read with many diagrams of the concepts. If you want to get closer to the code level then there is no better book than Andrew Tanenbaum's classic text: Operating Systems: Design And Implementation . This was the book that inspired Linus Torvalds to write his own operating system, which went on to become the phenomenon that is Linux! os.system() and subprocess.Popen provide different levels of process control and IPC. getuid(),getenv() and related features allow us to find out about the user and their preferences.